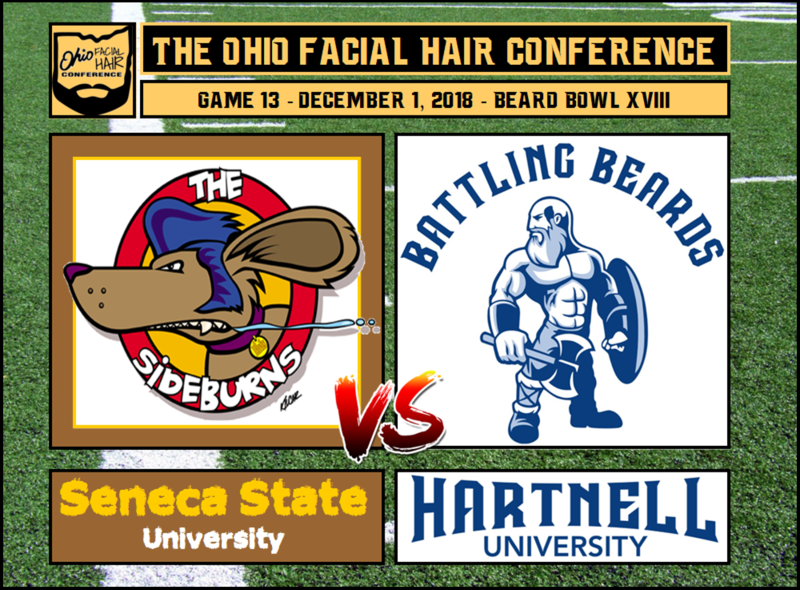 Seneca State University makes its third Beard Bowl appearance when the Sideburns (11-1) take on the Battling Beards (12-0) of Hartnell University. 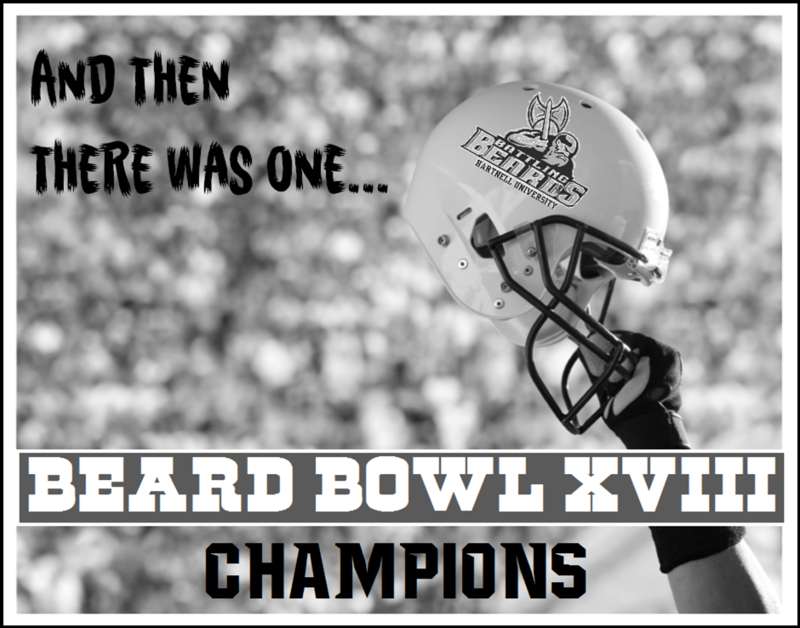 The Beards defeated the Sideburns in a 45-12 blowout earlier in the season and boast a 10-1 all-time record in the Beard Bowl. 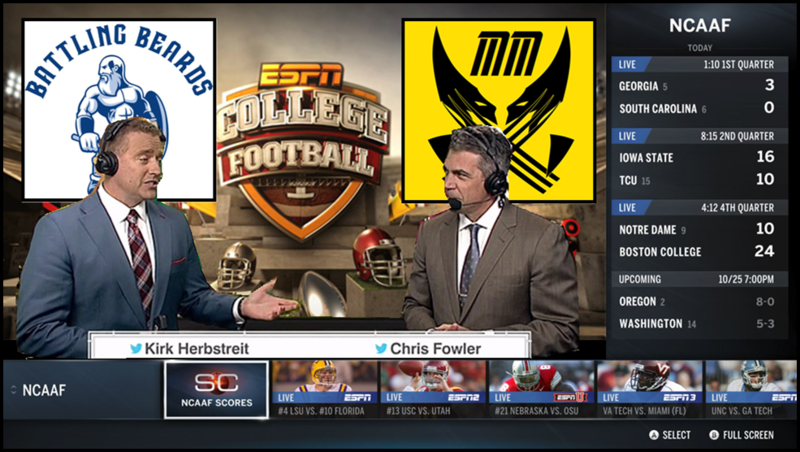 What will happen when the OFHC's top two teams square off one final time? 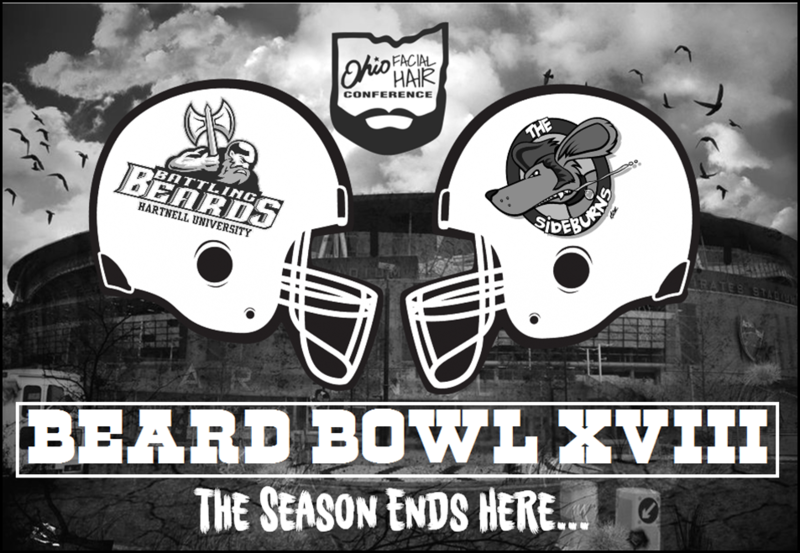 Kickoff for Beard Bowl XVIII is scheduled for noon from Columbus. 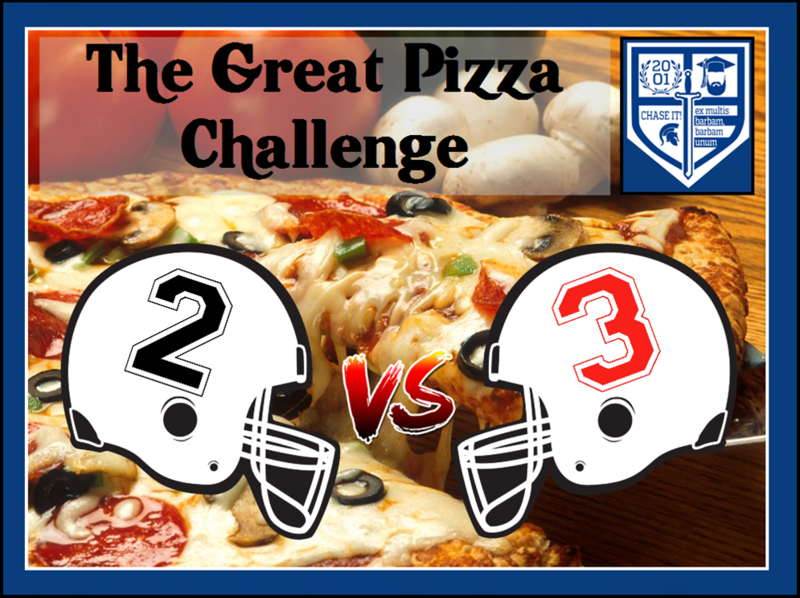 Period 2 faces off against Period 3 to determine who will reign "supreme" in The Great Pizza Challenge! 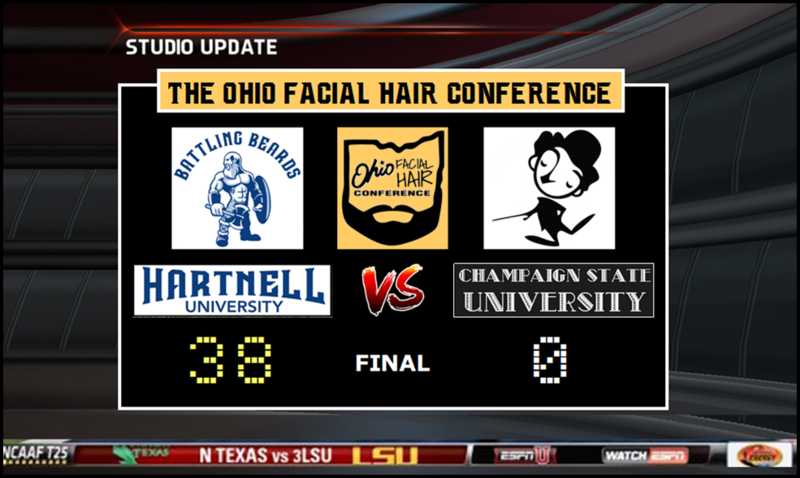 JEFFRY PATRICK'S 63-YD FG GIVES BEARDS 34-33 WIN; FINISH 13-0! 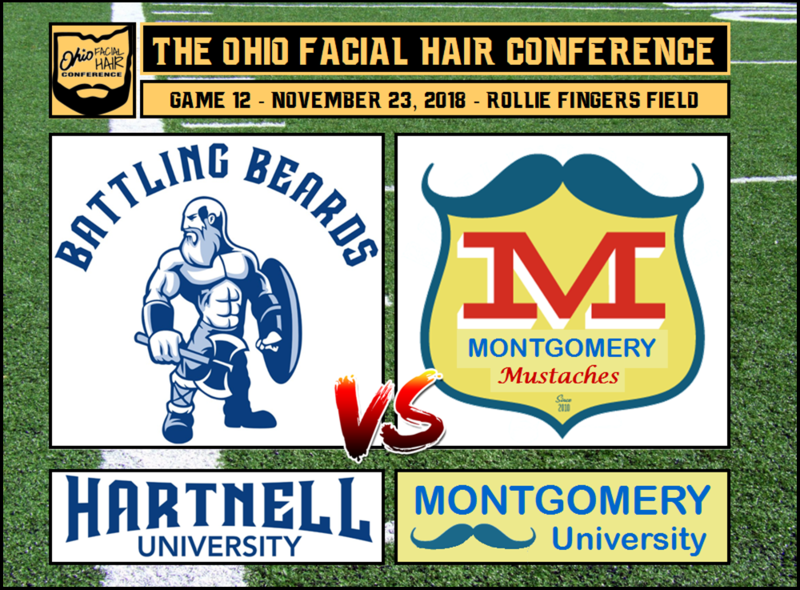 The undefeated Battling Beards (11-0) wrap up the regular season on the road against the Mustaches of Montgomery University (8-3) in a rare Friday game. A close-shave last week against the Chinstraps has Coach Alpheus Williams rethinking keeping his starters out for a second-straight game, but any roster changes will be game-time decisions. 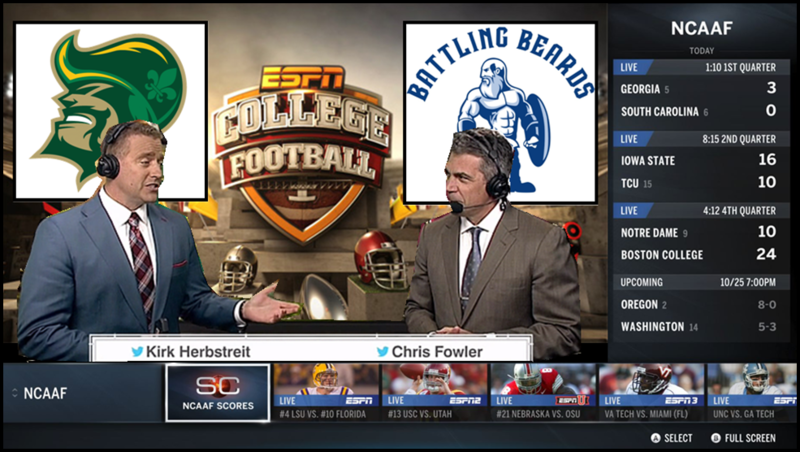 Kickoff is set for 3:30pm from Rollie Fingers Field. 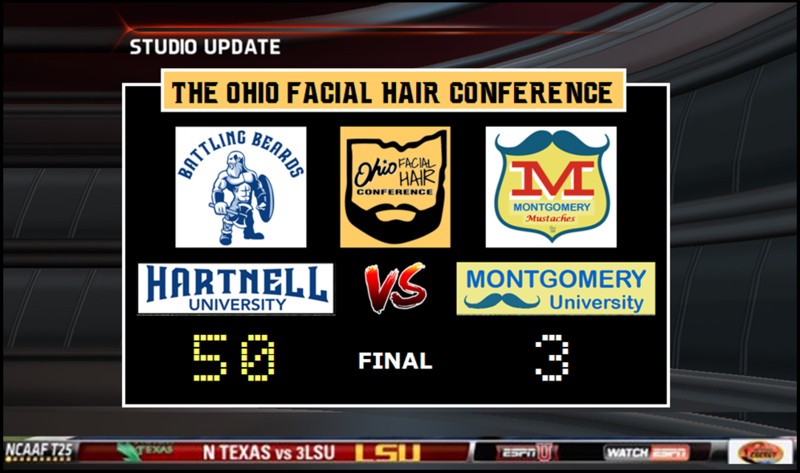 BEARDS MAUL MUSTACHES 50-3 TO FINISH REGULAR SEASON UNDEFEATED! Celebrations were in store as the Battling Beards (10-0) returned home with their third-straight OFHC title (and 12th in school history). 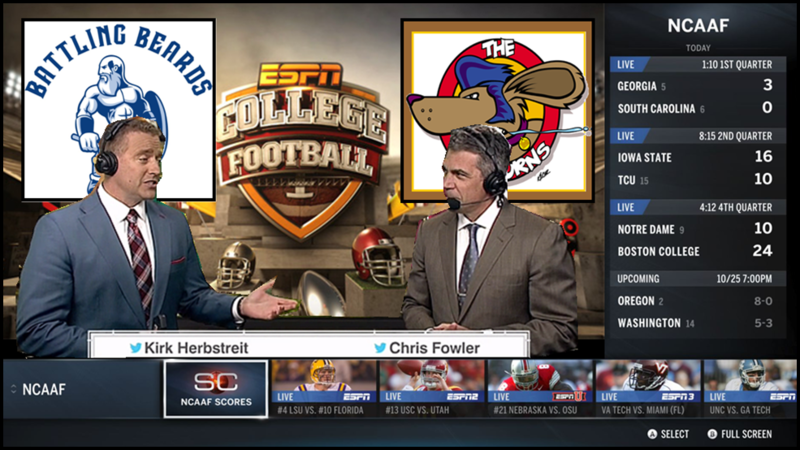 With two games remaining before Beard Bowl XVIII, Coach Alpheus Williams will shelve several starters but has stated that going undefeated remains a goal. 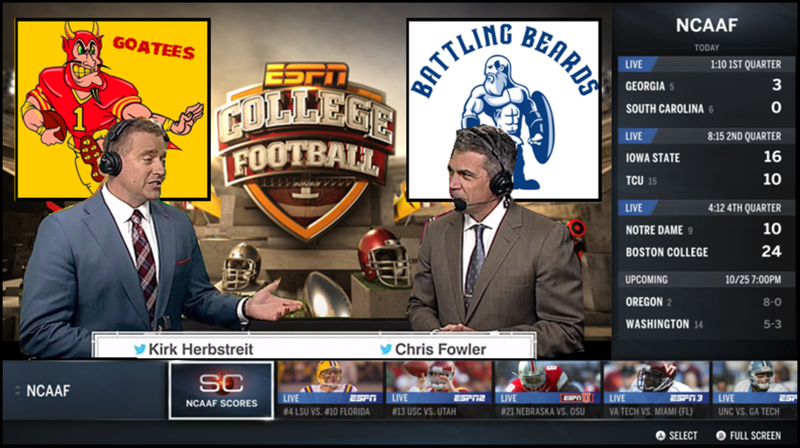 Don't expect the Beards to let up when the Chinstraps of Cuyahoga University invade Hartnell Stadium. Kickoff is set for noon. 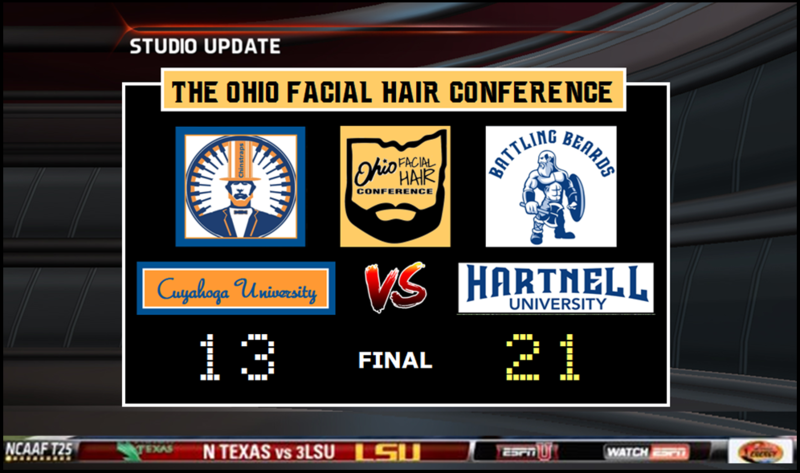 OFFENSE SPUTTERS BUT BEARDS HANG ON FOR 21-13 WIN OVER CHINSTRAPS! 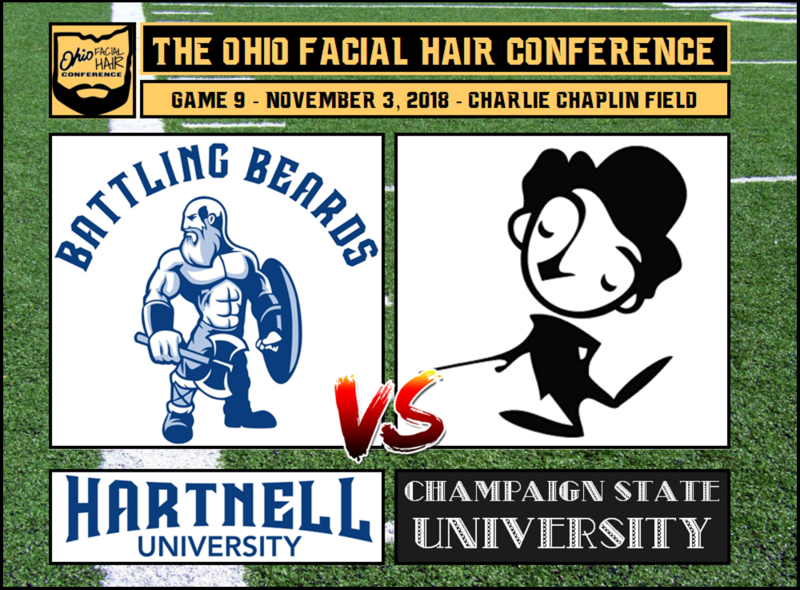 After an absolute dismantling of the Chaplins, Hartnell University (9-0) faces an OFHC opponent that has NEVER scored on the Battling Beards. In the 17 games played between HU and the University of Fulton, the Five O'Clocks (3-6) are 0-17 and have been outscored 952-0. 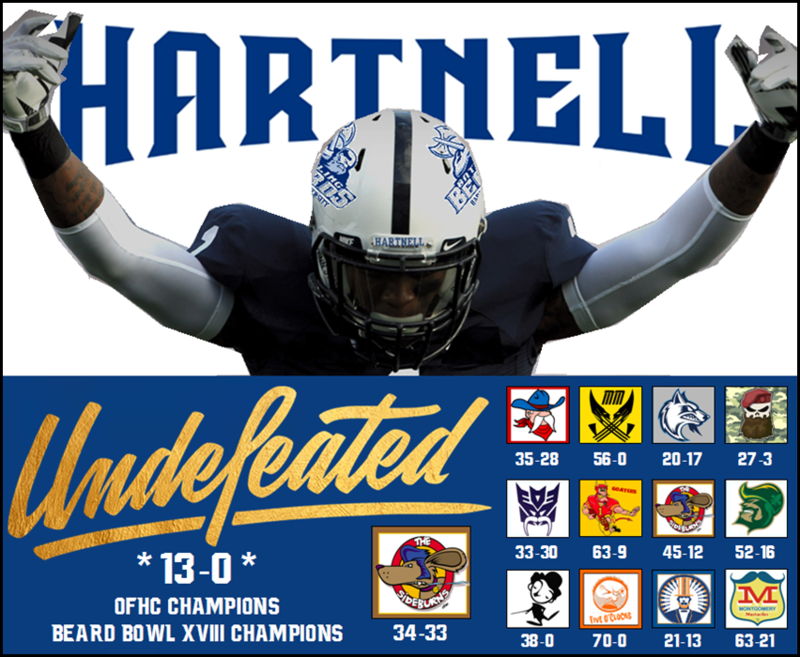 With a win, Hartnell University can claim the OFHC Title outright (their 12th title and third in a row). Kickoff is set for noon from Gillette Field. 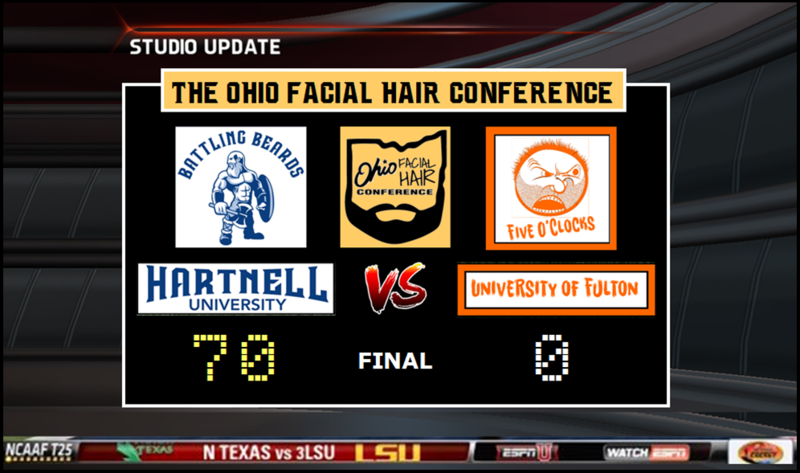 BEARDS DESTROY FIVE O'CLOCKS 70-0 TO CLAIM THIRD-STRAIGHT OFHC TITLE! 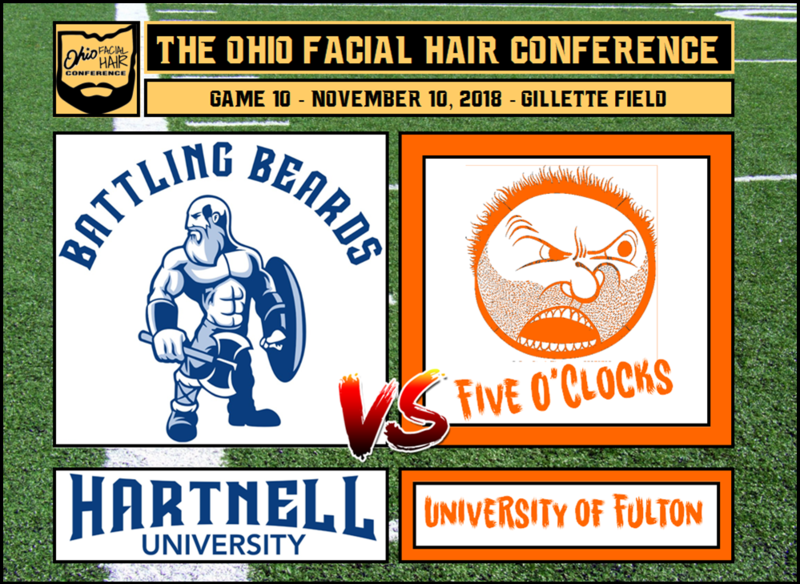 Hartnell University's "Quest for Perfection" continues when the Battling Beards (8-0) look to avenge last year's 13-3 loss to the Chaplins of Champaign State (4-4). 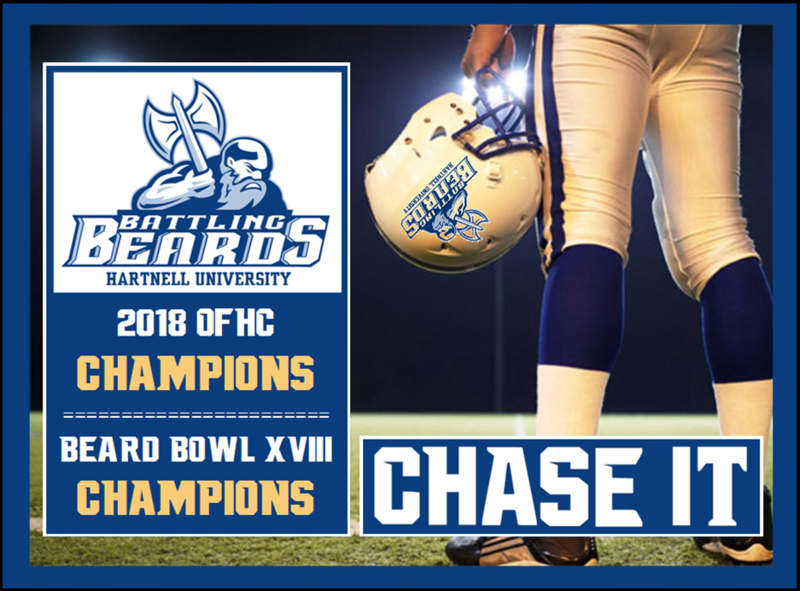 That loss was the team's first home loss since 2014, but it lit a spark that saw the Beards win nine straight to capture the OFHC and Beard Bowl XVI titles. Hopefully such a lesson won't be needed this year. Kickoff is set for noon from Charlie Chaplin Field. 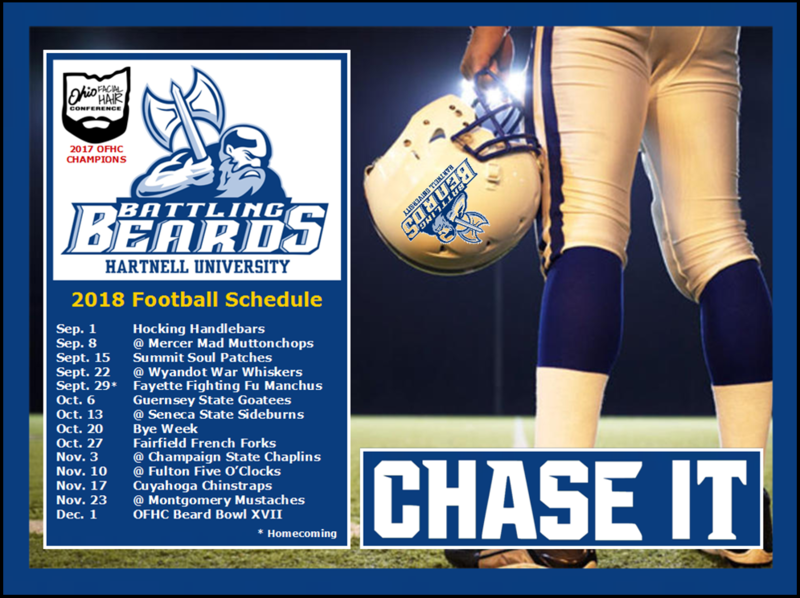 BEARDS BLANK CHAPLINS 38-0 IN REDEMPTION GAME! 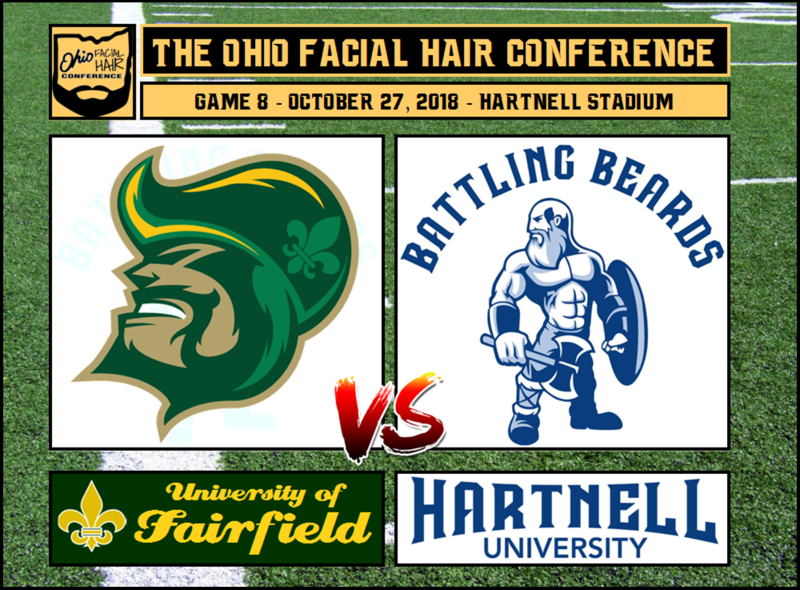 Fresh off their Bye Week, the Battling Beards (7-0) remain in the confines of Hartnell Stadium to host the University of Fairfield French Forks (1-6). 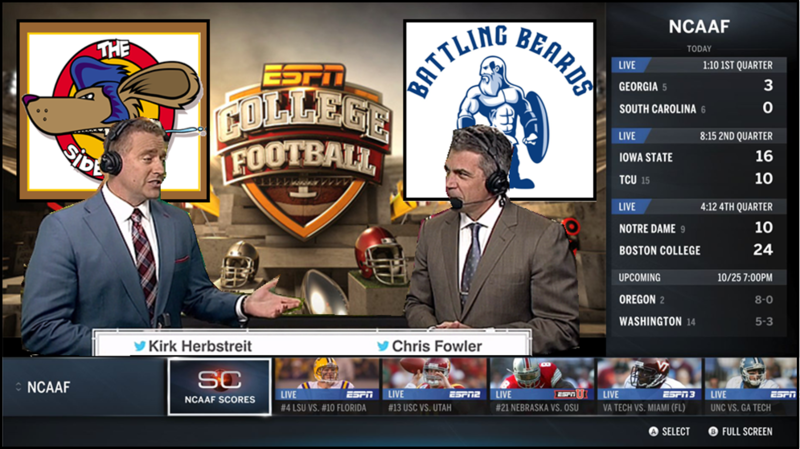 While Coach Alpheus Williams has done his best to silence any talk of an "undefeated season", the FPI shows Hartnell University has an 86% chance of winning out, which would be a first for the Beards in school history. Kickoff is set for noon. 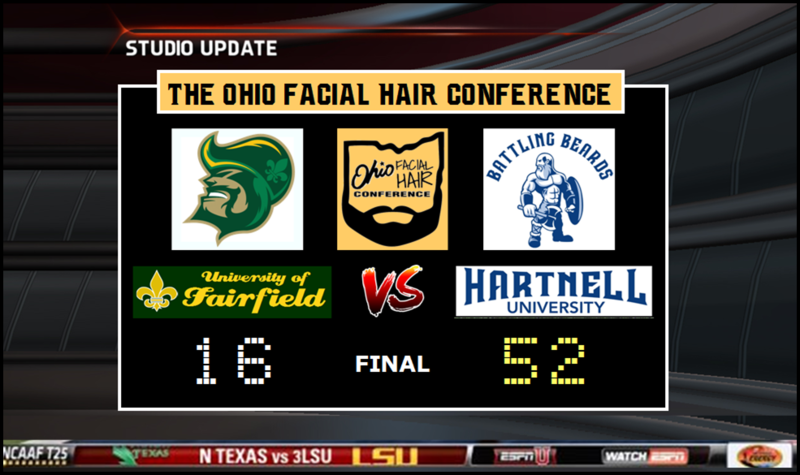 QUEST FOR PERFECTION CONTINUES WITH 52-16 BEATDOWN OF FAIRFIELD! 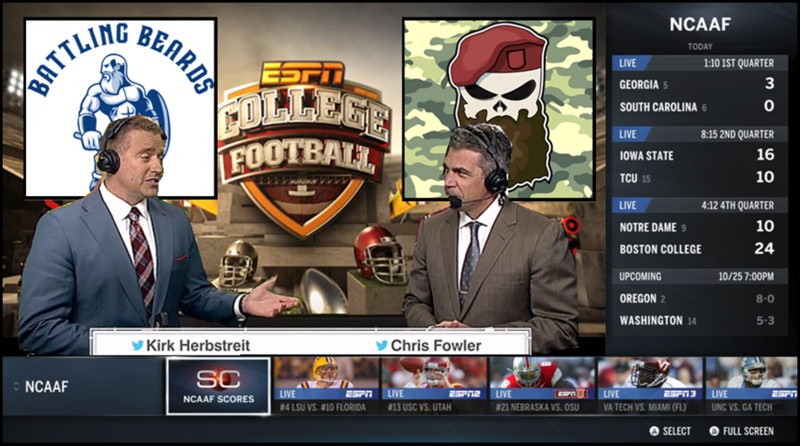 The "Beard Brawl" of 2004. The "Sideburn Slap" of 2008. The "Fawkes Fight" of 2016. 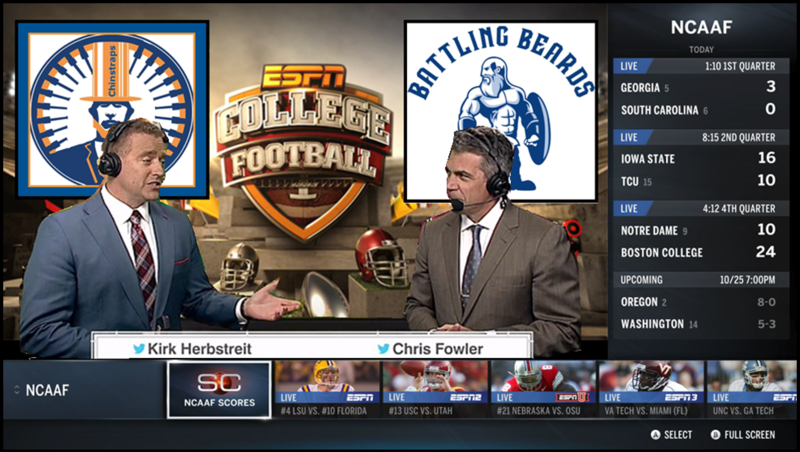 These on-field incidents further fuel the intense rivalry between Hartnell University (6-0) and Seneca State (6-0). 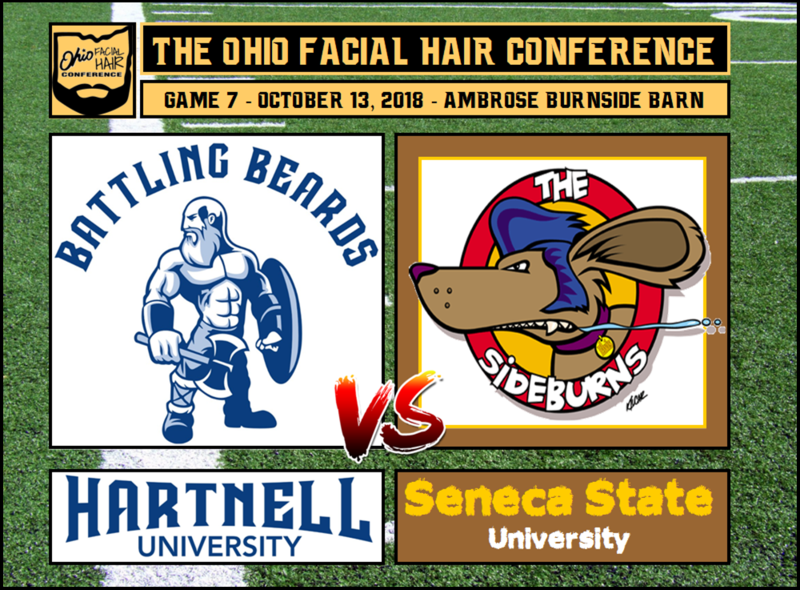 On Saturday, the Beards head to the league's only indoor facility in search of just their fourth win in school history in the much despised and raucous Ambrose Burnside Barn. Kickoff is scheduled for 3:30pm. RECORD OFFENSIVE ATTACK HELPS BEARDS SHAVE SIDEBURNS 45-12! 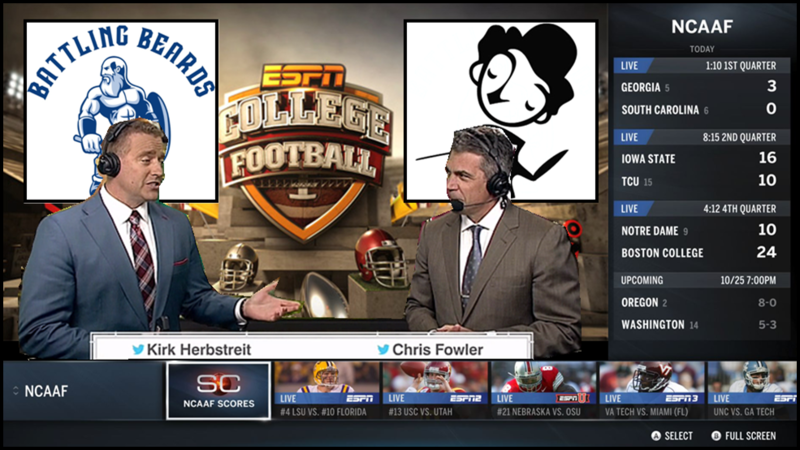 If ever there was a perfect time for a "letdown" game, it might be this weekend. 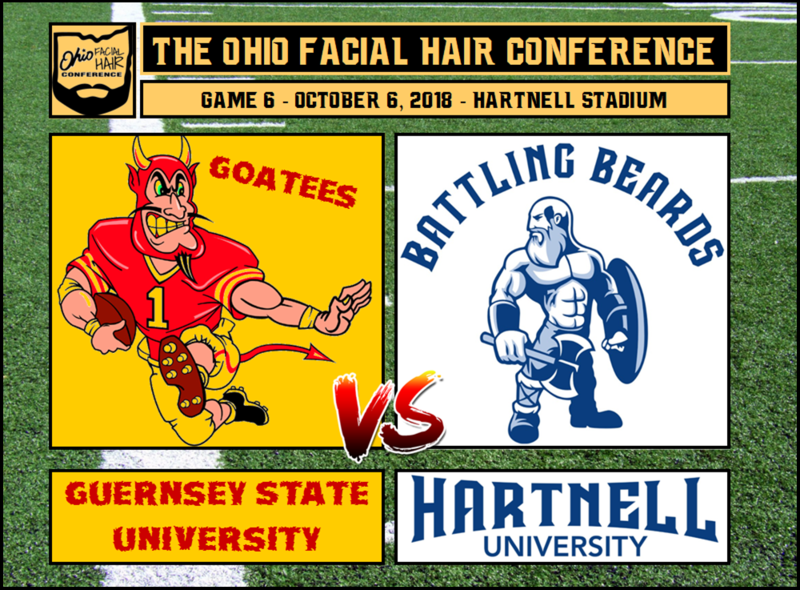 Coming off a thrilling OT victory against their rivals, the Battling Beards (5-0) welcome to town the Goatees of Guernsey State University (1-4). 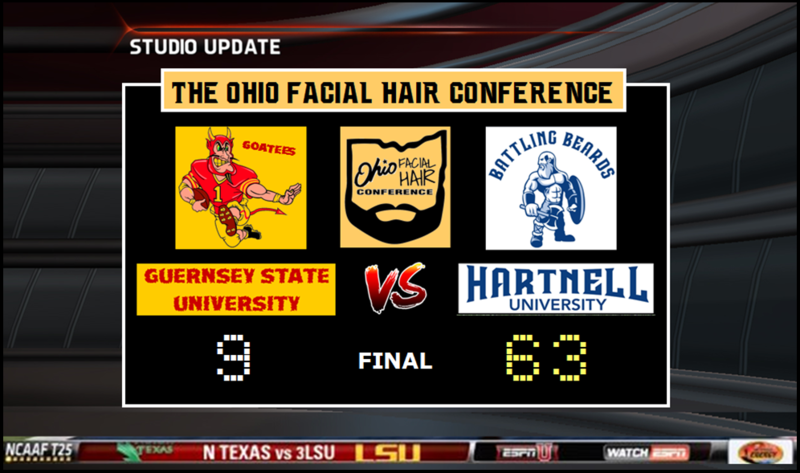 Hartnell University has also never lost to Guernsey, the only team in the OFHC that can boast such a win streak (17-0). 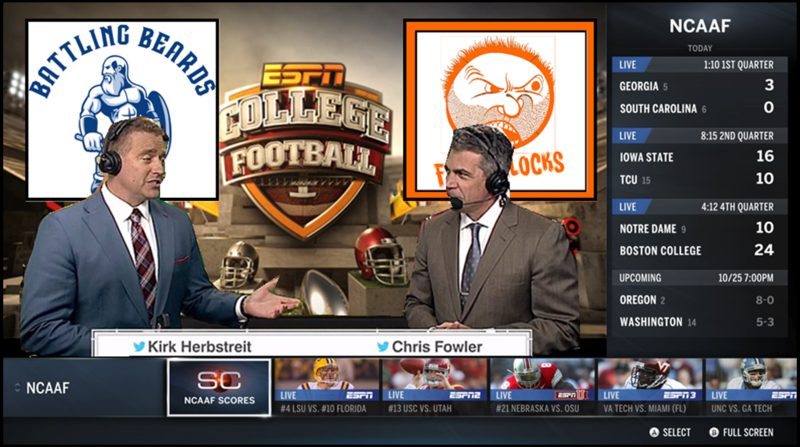 Kickoff is set for noon from Hartnell Stadium. 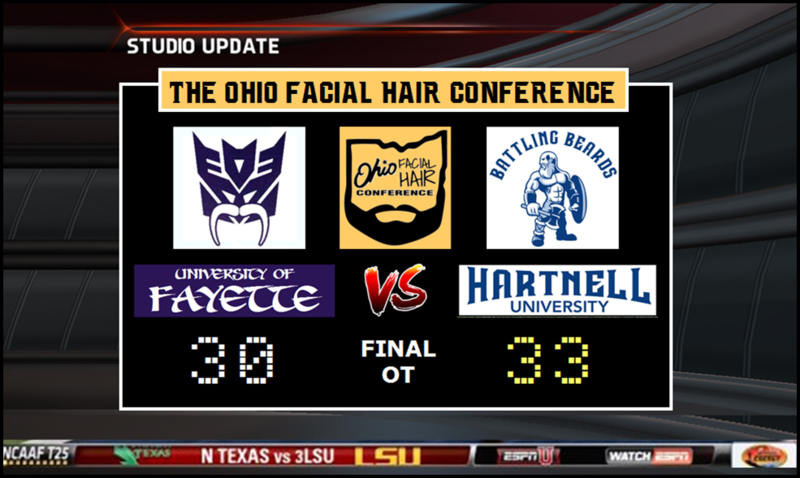 BEARDS SCORE 35 IN 1ST QTR EN ROUTE TO 63-9 THUMPING OF GOATEES! 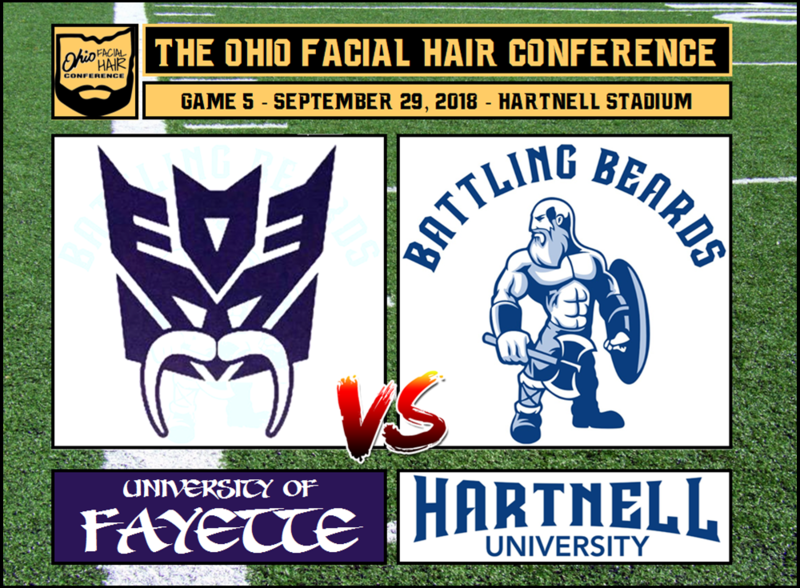 The Beards (4-0) return to Hartnell Stadium for Homecoming and face the Fighting Fu Manchus of the University of Fayette (3-1). 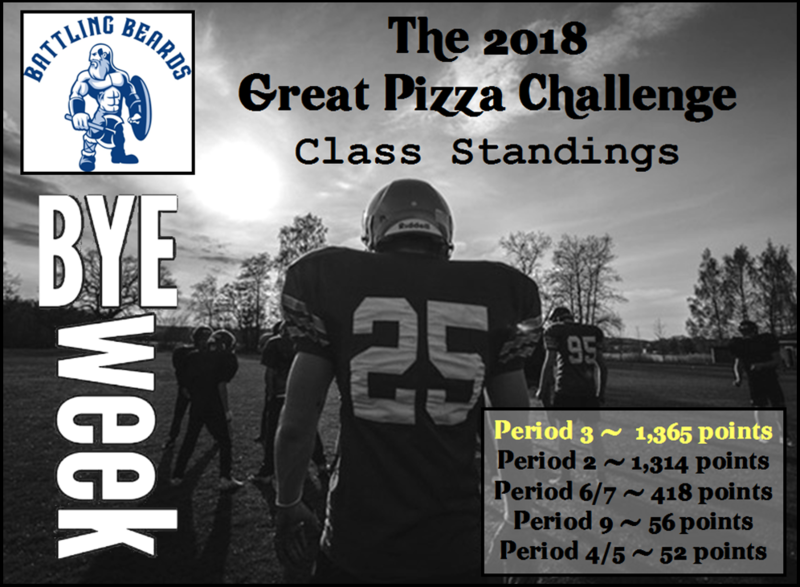 A rivalry since its inception in 2001, the series tilts in favor of the Beards 9-8, with the Beards winning the last five meetings, including last season's 56-45 shootout. 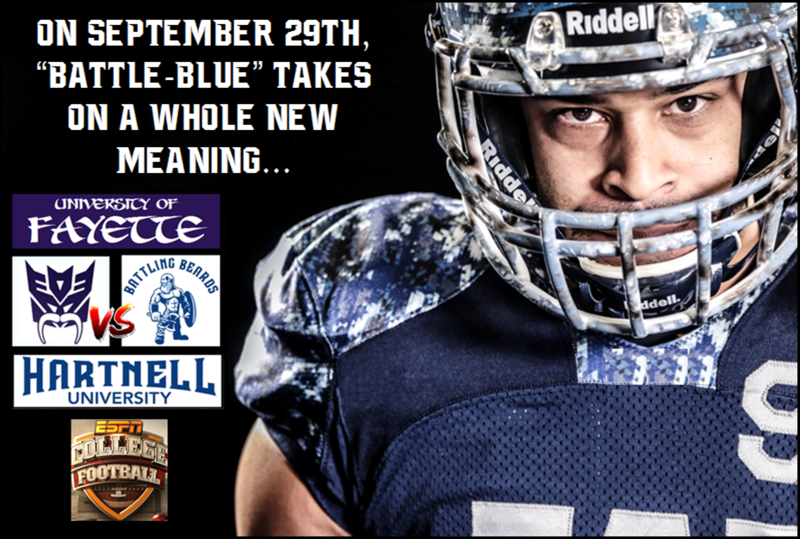 Fans will be treated to the sights and sounds of Homecoming... and "Battle-Blue" alternate uniforms! Kickoff is set for 3:30pm. 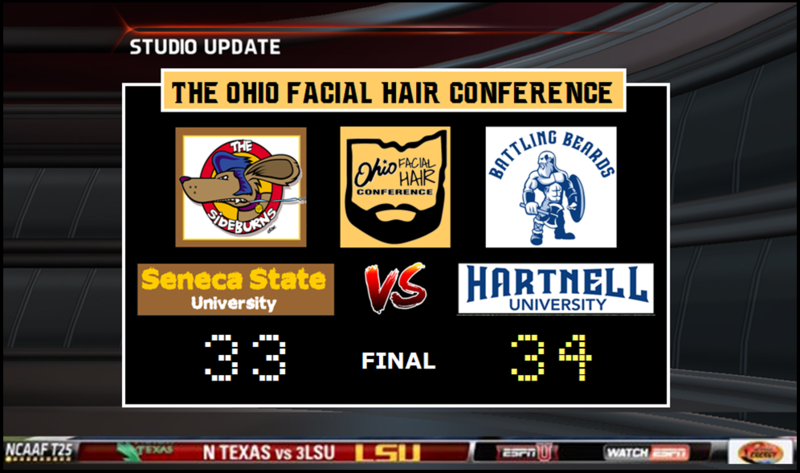 BEARDS BLOCK FAYETTE FG IN OT FOR 33-30 HOMECOMING VICTORY! 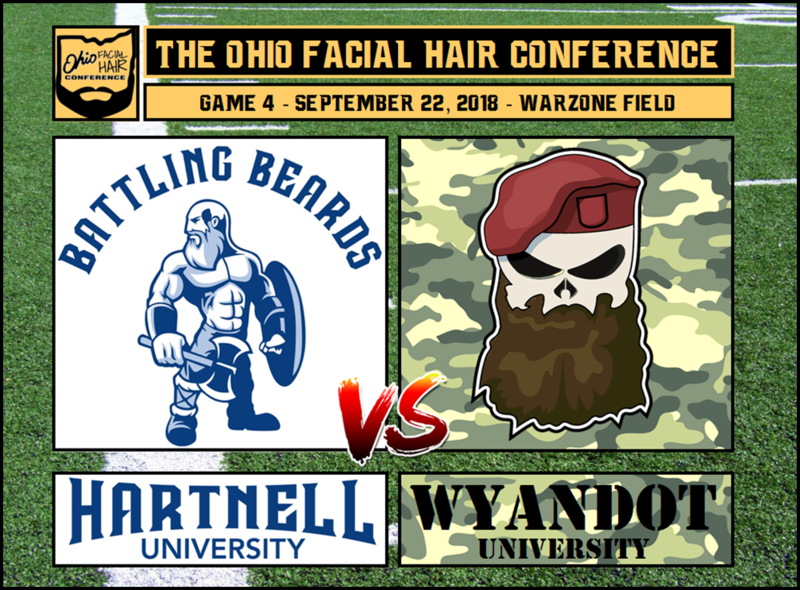 After finding a way to muscle through last week's showdown with Summit, Hartnell University (3-0) squares off with a Wyandot (3-0) squad that has historically given the Beards fits. 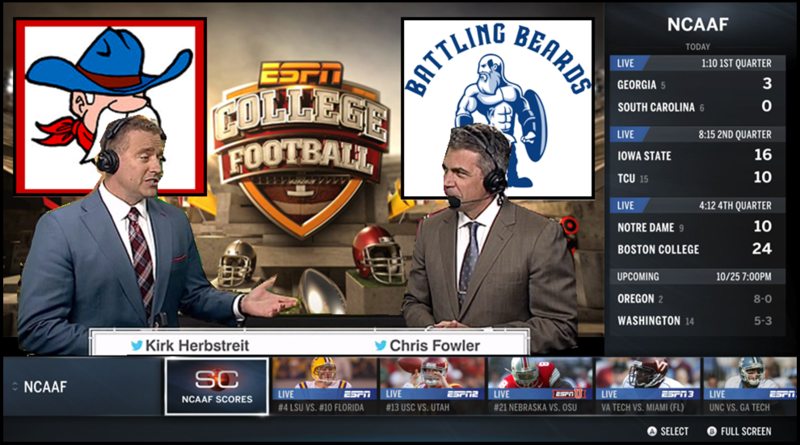 While the Beards hold an edge in the series (13-5), the War Whiskers have taken three of the last five and look to avenge last year's 48-7 drubbing and 2016's Beard Bowl XVI defeat. Kickoff is set for noon from Warzone Field. DEFENSE HOLDS WHISKERS TO -12 YDS AS BEARDS ROLL TO 27-3 VICTORY! 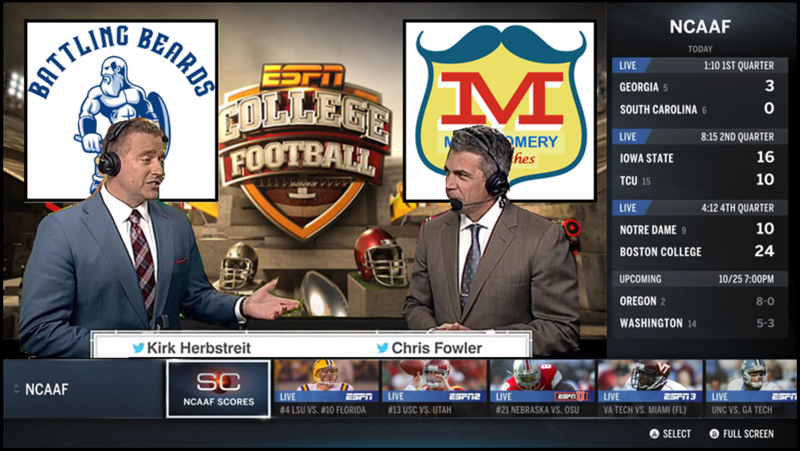 Last week's rain-soaked and chilly weekend conditions in Mercer sent the Battling Beards (2-0) home with a massive conference road win but also a stomach virus that has hit the locker room hard. 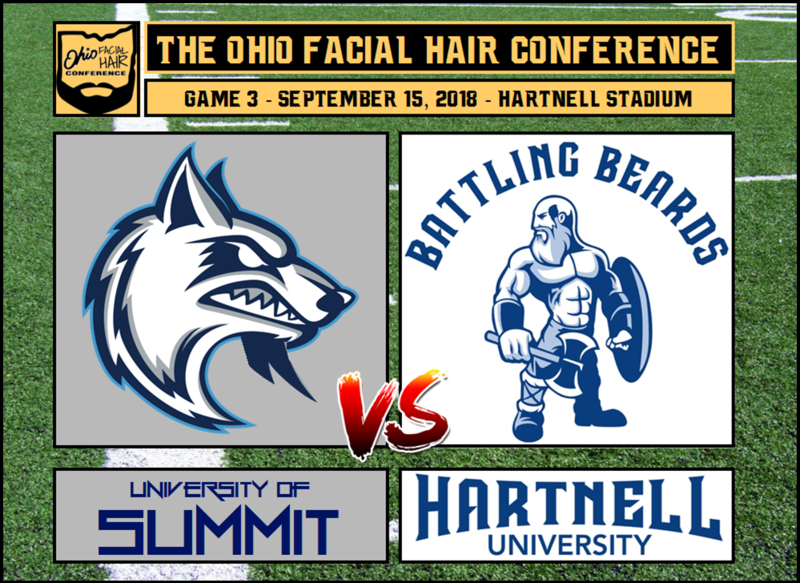 Plenty or rest and fluids, coupled with some film sessions, might be all the Beards get to prepare for the Soul Patches of the University of Summit (1-1). 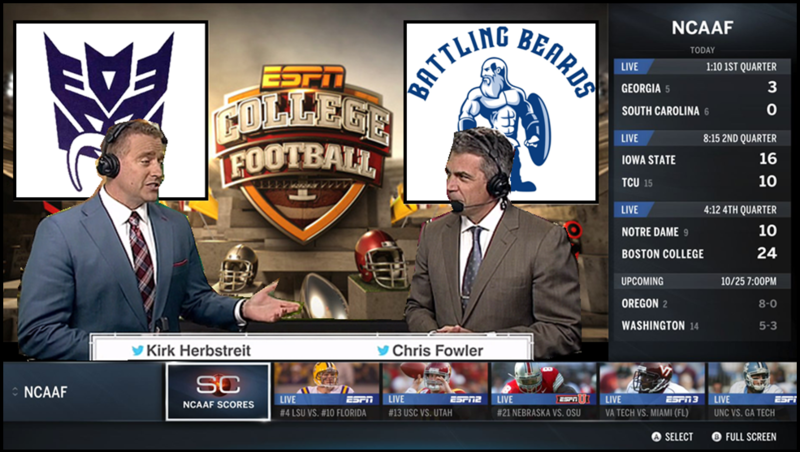 Kickoff is set for noon from Hartnell Stadium. 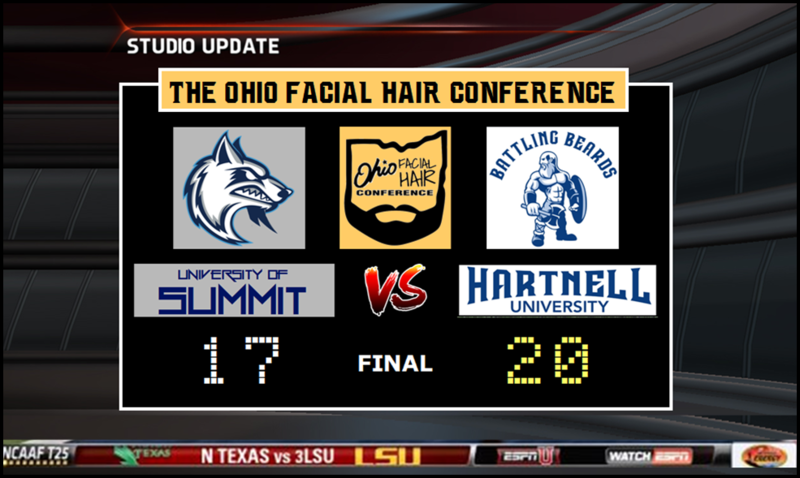 BEARDS OVERCOME FLU AND SLUGGISH START, RALLY FOR 20-17 WIN! 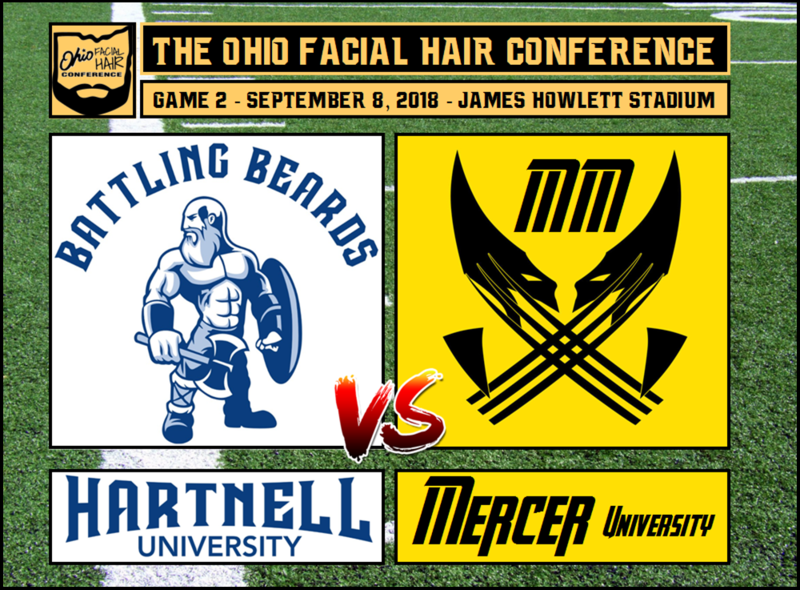 After picking up their first win of the season in a thrilling rematch of Beard Bowl XVII, the Battling Beards (1-0) hit the road and travel to Mercer University (1-0). 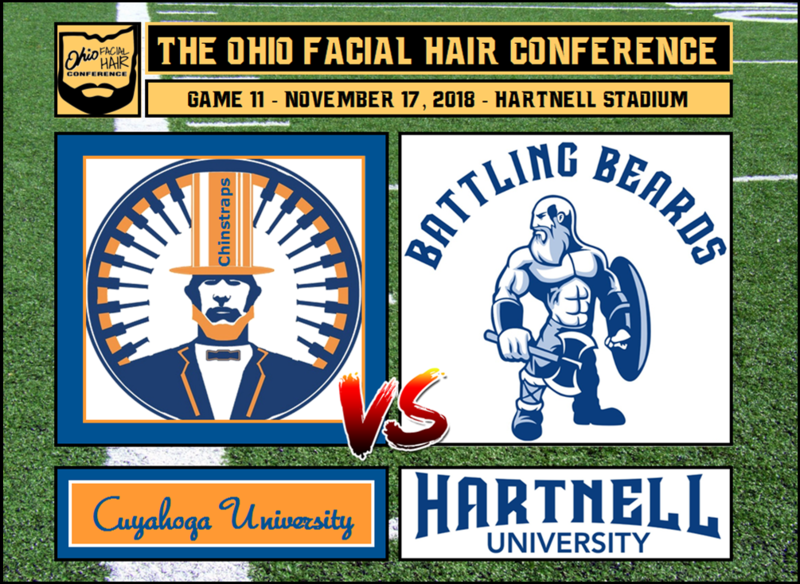 While Hartnell University has dominated the Mad Muttonchops in the last two meetings (45-0 in 2016 and 27-0 in 2017), Mercer did the same to the Beards in 2014 and 2015 (both 21-0 victories). Kickoff is set for noon from James Howlett Stadium. BEARDS PUMMEL HAPLESS MERCER 56-0 FOR RAIN-SOAKED ROAD WIN! 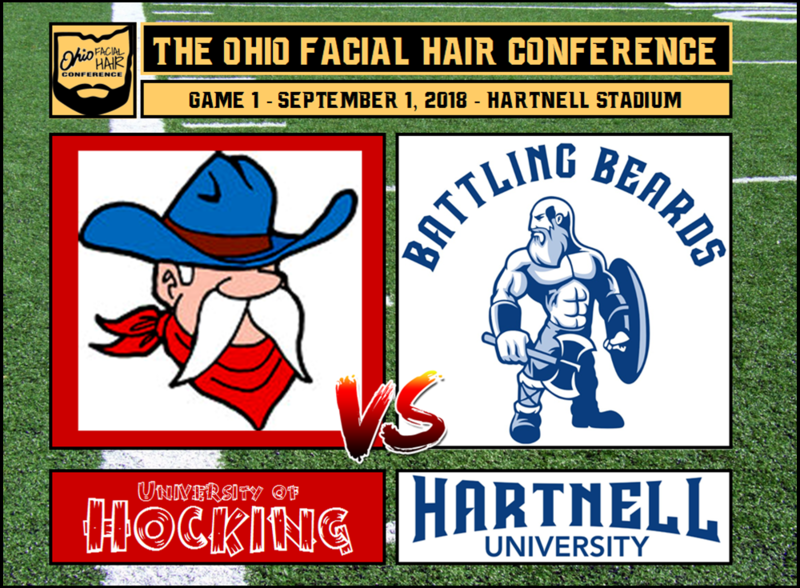 The 2018 season kicks off with a rematch of Beard Bowl XVII when the Handlebars of the University of Hocking (0-0) invade Hartnell Stadium to square off against the Battling Beards (0-0)! 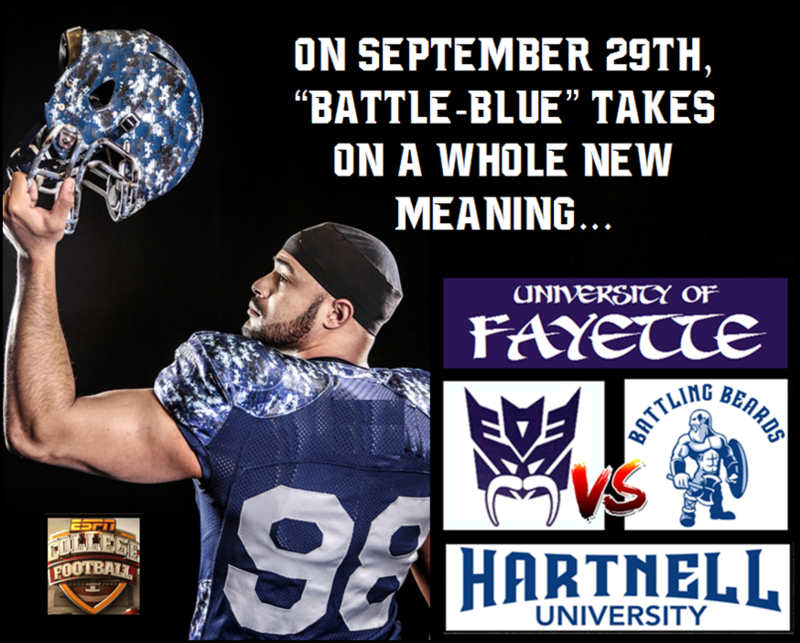 Will it be a repeat of last year's thrilling 26-23 OT win for Hartnell University, or can Hocking pull off a season-opening upset? 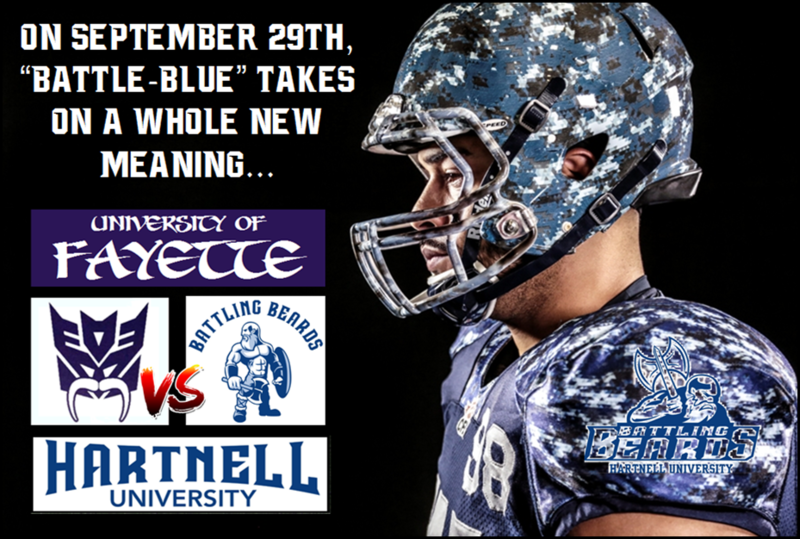 With both schools returning all 22 starters, you won't want to miss this one! Kickoff is set for 3:30pm. 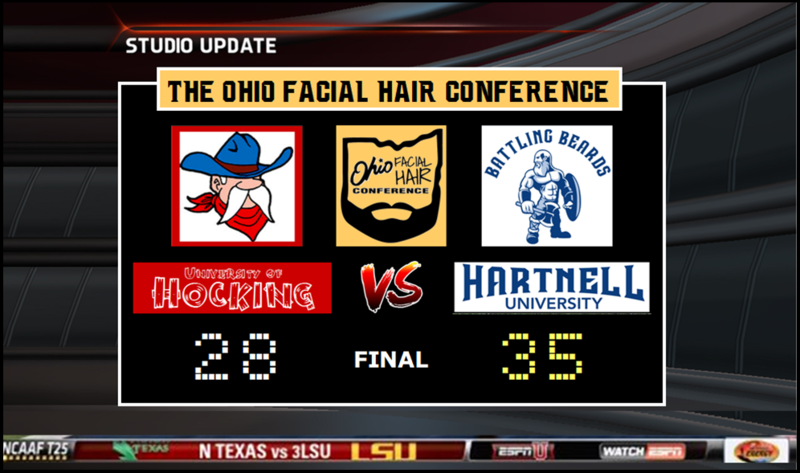 DEFENSE SHUTS OUT HANDLEBARS IN 2ND HALF TO PRESERVE 35-28 WIN!